Whether you are looking for information on one specific area of marketing or books and products that will allow you to study on your own we can accommodate you. Learn tips, techniques and exercises to help put together the most cohesive and comprehensive marketing plan for your practice. 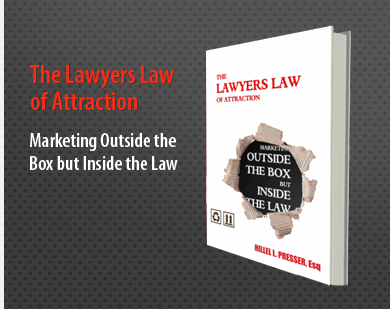 The Lawyer's Law of Attraction: Marketing Outside the Box, but Inside the Law: Whether you're a seasoned lawyer or straight out of law school, chances are that you're looking for ways to increase either the quality or quantity of your clients. While you may know how to reach your market, you may not know how to reach out to them in a way that will cause them to react favorably. You know there are tools that will help. This book will teach you how to use them. Written by a successful, practicing lawyer, for lawyers, this book will show you how to market your law firm into a multi-million dollar machine. Marketing Basics Learn everything you need to know about the basics of marketing to start building a great foundation for your law practice. Knowing your market The focus of this book is twofold. One, it will teach you how to identify your clients as well as your true competitors. Two, it will teach you to look at and learn from past marketing successes and failures. Carving a niche The focus of this book is to define who you are and what you're selling specifically. Additionally, it will show you how to determine what your niche is if you're unsure. Branding This book focuses on the creation of a cohesive brand identity. Through a series of steps it will help you to define your brand, differentiate your brand, harness creativity and harness uniqueness all so that your brand is the right fit for you and your practice. Becoming an expert The focus of this book is to help you build and boost your credibility as an authority. It showcases how to figure out your areas of expertise, ways to share it, and what to do in order to remain credible. Networking The first part of the book deals with building your professional network and the second part of the book explains how to obtain referrals to your practice. Making media work: Social media The focus of this book is the identification and proper utilization of social media sites as they relate to your practice. Making media work: Online marketing The focus of this book is the way in which tools such as websites and blogs can be used as a means of drawing in clients for your practice. Additionally, information is provided on how to use newsletters and pay-per-click ads as well as a means of online marketing. Making media work: Public relations The focus of this book is how you can work to secure placements on television and radio as well as within magazines. The book details both the work you will have to do as well as helps you to discover which outlets will be best for your practice. Traditional marketing The focus of this book is traditional marketing efforts. It addresses marketing that can be undertaken without being online. Specific insight is provided on methods such as offering sponsorships and producing direct mailers. Becoming a VIP Learn how to incorporate value, integrity and persistence into your everyday lawyer marketing strategies.